This Just In: HennaHealing will definitely be at Earthfair!! Come check us out there, or be in touch if you want to schedule another summer henna session!! Your everyday purchases can help Madrona! Greetings friends and families! I am excited to announce that the Madrona Primary School is are now a part of the wamoola for schools project!! It is a program where anyone who has a Washington Mutual debit card can go to the website below and associate their card with a participating school. WAMU gives points toward the chosen school for every time your card is used, and at the end of the year, they make a cash donation to that school based on these points. You may have seen the article in one of the last weeks beachcomber about this, I have gone to this site and checked it out as well as associated our family's accounts with it. I know that many of the other schools on the island have done this. I have no idea what the percentages or amounts are, but I am excited to see what benefits we can reap from this program. Click on “enroll now” and fill in the blanks. It is quite easy to do! I am so grateful to have this program in place to support our schools and ultimately education as a whole! Serial release only at KotaPress!! Our own Joan M. McCabe has just released Chapter 8 of her novel Tapestry of Time, and you can only read it here!!! 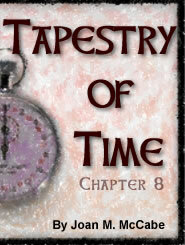 Click here to read chapter 8 of Tapestry of Time!!! Vashon Student Artists on Exhibit!! In the King County Library, VHS Mythology students have a display of their Personal Shields that they created with teacher Anders Blomgren and artist Carol Schwennesen as a VAIS project. In Bob's Bakery, there are nine framed abstract self-portraits from McMurray 8th grade Humanities students of Karen Person. Karen worked with artist Jeffrey Zheutlin in another VAIS collaboration. At the Green Door Gallery between Blooms and the Heron's Nest---The VHS Tile show produced by Amy Dubin and students. Amy learned to make ceramic tiles from artist Irene Otis in a VAIS residency at McMurray many years ago. And at the Blue Heron Gallery, photographs by Terry Swift's photography students. McMurray photographers submitted an application to the Heron last fall and went through the jury process just like any other artists who wanted to show this year at the Heron Gallery. Come and experience the joy and exhilaration of spontaneous self-expression in a supportive vocal community. Improvisation leads us to the core of our authentic selves and is a playful, practical and body-based way to learn about how music and the magic of being in the moment work. We will do improvisation games with call and response, drones, ostinatos, chord progressions, grooves and body percussion. We will explore song forms, scales, rhythms and bass lines from a range of world cultures and musical styles such as jazz, blues, funk, West African, Brazilian and Afro-Cuban and use these musical elements as springboards for improvisation. To help bring forth our own songs, we will do exercises integrating voice with gesture and movement. We will also explore the listening skills and open personal presence needed to make spontaneous music in an ensemble, moment by moment. Workshops include a physical and vocal warm-up. Please wear loose and comfortable clothing and bring drinking water. People new to singing as well as vocalists with experience in any musical style who want to explore improvisation are welcome to attend. Come ready to move, play, giggle, be out loud and take risks! Things are Hoppin' at Cafe Luna! There are so many summer activities and performances happening at Cafe Luna that it is getting hard to keep up with it all!!! Not to fear -- you can now check it our their events online anytime at www.cafelunavashon.com!!! Stop by in July for the first Friday art walk -- Hawk's having a new show of his digital photography. Should be fun!! Have Vashon related news, announcements, or art? Email us and we'll post here in the KotaPress Vashon Journal for you!